Claire Waldoff, the chanson and cabaret singer with the snappish voice, has been an entertainment star for more than three decades. She never made a secret of her love to Olga von Roeder - they were inseparable for 40 years. Even today, her hits like ”Hermann heeßt er“ (His name is Hermann), “Wer schmeißt denn da mit Lehm?“ (Who’s throwing clay?) or “Hannelore“ are a pleasure to listen to - and worth (re-) discovering. Claire was deemed a Berlin gal par excellence, although being born in the German Ruhr Basin. She was born Clara Wortmann to a family with many children on October 21, 1884 in Gelsenkirchen where her parents kept an inn. Her original intent to become a physician did not come true because the family had no money. She decided instead to go to the theatre and had her first engagement in the sticks in 1903, directly after graduating from high school and without ever having attended a drama school. She soon tried her luck in the capital of Berlin and eventually ended up in a cabaret, an art form freshly imported from Paris around 1900. In “Roland“ she intended to perform texts of the poet Paul Scheerbart and folk song, in fact in an Eton boy suit. Three days before the opening night, censorship thwarted her intent: the texts of Scheerbart are deemed anti-military and in addition, women on stage in male attire were banned after 11 o'clock, the start of her performance. In order to save her debut, the young composer Walter Kollo wrote a harmless song about a drake lusting for love and his “Schmackeduzchen“. Over night, Waldoff became the “star of Berlin“ with this song. Her recipe for success? ”My simple way, without gestures, only oriented to facial expression, to the expression of the eyes, was something new on the cabaret stage. I was and remained a big star in my simpleness“, she wrote in her memoirs Weeste noch ...? (Do you remember …?) This was, of course, supplemented by talent, a sense of art, a very modulatory voice and catchy melodies. It was already before World War I that she developed her own profile with her popular songs, hits, and chansons in a Berlin dialect. Her repertoire eventually included approximately 300 songs. From the mid-20s, Claire Waldoff celebrated her greatest successes, performed one-woman shows in the two largest Berlin Varietés, the Scala and the Wintergarten, and on all other renowned stages in Germany. The socially active artists became popular all over Germany through radio and disk recordings with record circulations. The coming into power of the Nazi regime meant a significant turning-point for Waldoff, however, not an abrupt ending of her career. Her living and working conditions in the Third Reich are surrounded by mystery. Arrests and stage bans are again and again implied. Actually, the singer was subjected to a “political stage ban“ at the beginning of 1933 because she participated in events of the communist Red Aid. However, she returned to the stage after having presented her “Aryan proof“ and having joined Goebbel’s Reich’s culture chamber. The audience still loved her despite - or just because - her hallmarks - neck tie, shirt, and “bronze-red crackling page-boy cut" and sometimes “smoking and swearing like a dustman“ as declared her friend Heinrich Zille - she did not meet the type of women propagandised by the regime. Her cohabitation with Olga von Roeder also did not comply with the “popular sentiment“ of the Nazis. Her songs, to the extent known, also lacked anything nationalist and racist. 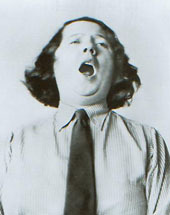 There is proof of Claire Waldoff still performing at the beginning of 1943; in January 1942 even in Paris which had been occupied for one and a half year at that time. This served to spread high spirits among the soldiers. While Waldoff sang before the armed forces, Marlene Dietrich, her former friend and the "love of her life“, who turned her back on Nazi Germany and sang before American soldiers, soon was to move into the liberated Paris together with the allied forces. Waldoff and Olga von Roeder did not return to the “capital in ruins“ after 1945 from Bayrisch Gmain where they had lived since the outbreak of the war. Although Claire still played to capacity crowds at the end of the 40s and the beginning of the 50s, she could not continue her career. She lost all her savings in the currency reform of 1948 and got into financial distress. In view of her personal and political situation - in an interview in 1954 she complains that Nazis were still in executive positions in Bavaria - she increasingly resigns. The West Berlin Senate finally grants her a small honorary pension at her seventieth birthday. “Life has no longer any meaning to me“, Olly writes broken-heartedly shortly after Claire’s death - who died on January 22, 1957 from a stroke - to the friend Paul Marcus. “We were connected to each other too dearly after forty years of being together and this gap can never be filled again. We actually lived only one for the other. [...] I would be glad if my ashes were to rest in peace together with Claire’s ashes.“ This wish of the bereaved came true in 1963. Both women rest together in their last resting-place on the cemetery Pragfriedhof in Stuttgart. Schoppmann, Claudia: Claire Waldoff (1884-1957) [online]. Berlin 2004 Available from: Online-Projekt Lesbengeschichte. Boxhammer, Ingeborg/Leidinger, Christiane. URL <http://www.lesbengeschichte.de/Englisch/bio_waldoff_e.html> [cited DATE]. Claire Waldoff, „Weeste noch?“ Erinnerungen und Dokumente, Ed. Volker Kühn, Berlin 1997; Maegie Koreen, Immer feste druff. Das freche Leben der Kabarettkönigin Claire Waldoff, Düsseldorf 1997; CDs e.g. Claire Waldoff, Es gibt nur ein Berlin, Duophon.